June 2nd, 2017 at the Cache County Fair Grounds in Logan, Utah. Clipping: All animals are not required to be clipped but it is recommended that they are. Milk Out: There is not a mandatory milk out, but over uddering of your does will be discriminated against. Arrival Times: For those of you traveling a distance and staying the evening before the show, pens will be available the afternoon of the 2nd at 5:00 p.m.
Bedding: The fairgrounds no longer allows bedding with straw, so you are welcome to bring your own shavings, or buy them from a local bedding dealer. There are also several hotels in the area that will be available. LaManchas, Nubians, Nigerians, Oberhasli, Recorded Grades, Saanens, & AOP. AOP, LaMancha, Nubian, Saanen, Nigerian Dwarf, Oberhasli, then Recorded Grades with ring two to follow in the same order. Show Order subject to be changed at the discretion of the show committee, judge and exhibitors. All effort to prevent over or under uddering will be considered if the show order is changed. Class Schedule: Please indicate class and breed codes on entries. Breeds Codes: L - LaMancha, ND - Nigerian Dwarf, N- Nubian, O - Oberhasli, R -Recorded Grade, S-Saanen, & AOP - All Other Purebreds. Please use one entree submission for each child with only their goats listed on their form. 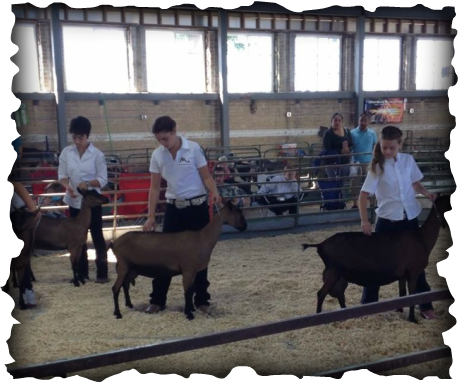 All youth must be entered into a showmanship class. They can use any goat of their choosing even whethers. There will also be a peewee class added for those siblings that aren't old enough to participate in the youth show. This class will be for children under the age of 8 as of January 1st 2016. If you have a peewee showman, please list their names in the box below. Discount $3.00 if entered before 5/20 with ten or more goats total per family. Please note: You will incur a $25 processing fee for any check returned due to insufficient funds in addition to any Bank imposed fees. Failure to pay will result in UDGA using all legal means available to obtain payments in full, additional costs will be added to your exhibitor fees. I agree to release the Utah Dairy Goat Association and The Cache County Fairgrounds from any and all liability for injury and/or damages to myself, family, members, animals, and/or property while participating in this show. I further agree to assume full responsibility while on the show premises for the actions of myself, family members, and/or animals. Exhibitors must sign here. If under 18, a parent or guardian must sign.